At Cedar Crest College, students learn to become leaders for life. Cedar Crest College is located in Allentown, pennsylvania, the third-largest city in the state and home to 115,000 residents. The beautiful 84-acre campus is just one hour from Philadelphia and two hours from New York City. It’s within driving distance to Pittsburgh, Boston, and Washington, DC. Number of faculty: 77 faculty members; 72% hold a PhD or terminal degree in their field. Colleges, Programs, and degrees: Cedar Crest offers more than 40 undergraduate degrees in a wide variety of majors, including Business and STEM. The College also offers graduate-level programs through the School of Adult and Graduate Education (SAGE). Geographic diversity: Cedar Crest students come from 29 states and 29 foreign countries. International student services: Cedar Crest College offers international student advisors, ESL/cultural support, and international student orientation as well as social and cultural events. The new Center for Diversity and Global Engagement opened in January 2018. Financial aid: Cedar Crest offers merit scholarships for first-year international students that range from $16,000–$21,000. Application Deadlines and Fees: Cedar Crest offers rolling admission with no application deadline or fee. For over 150 years, Cedar Crest has taken a bold approach to education by creating a college and curriculum primarily for women who want to achieve at the highest levels. Recognizing the multidimensional nature of students, Cedar Crest College is dedicated to the education of the next generation of leaders by preparing the whole student for life in the global community. 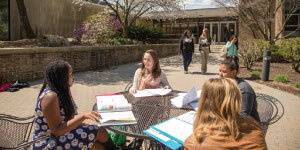 At Cedar Crest College, education is more than lectures, textbooks, and exams: our students learn through experience. From internships to research projects, Cedar Crest students graduate with skills that employers find valuable and that allow them to immediately contribute to their career fields and communities in a positive way. The College offers more than 50 academic programs—including Business and STEM majors—but no matter the field of study, students can always incorporate their passions into their Cedar Crest experience. Whether athletics, dance, theatre, or even a second major, we offer a customized academic experience. Not only do we provide students with an outstanding education grounded in the liberal arts, but we ensure that students graduate in four years through our Four-Year Guarantee program. International and cultural engagement lead to real-world competencies, which are in high demand by graduate schools and employers. To promote the development of these skills, Cedar Crest opened the brand-new Center for Diversity and Global Engagement in January 2018. The Center can be utilized by international students, English-language learners, students from diverse cultural and ethnic backgrounds, and students interested in learning more about the world. In addition to programming, the purpose of the Center for Diversity and Global Engagement is to provide cultural, social, and academic support to students of diverse backgrounds. The Center is a welcoming space where all students can connect and share experiences and ideas. In addition to the Center for Diversity and Global Engagement, Cedar Crest’s Office of International Student Services also aims to enhance the student experience and encourage intercultural exchange on campus. International students may take advantage of student advisors, ESL/cultural support, international student orientation, and many social and cultural events. For the eighth year in a row, Cedar Crest College was named among the top colleges in the nation by U.S. News & World Report’s 2019 “America’s Best Colleges” rankings. The College has also been recognized for its ethnic diversity and for having one of the largest proportions of international undergrads in the northern region. Of the more than 1,600 students on campus, 37% come from diverse backgrounds, while 10% are international students representing 29 countries around the globe. Whatever your interest, there’s something for everyone at Cedar Crest College. We offer 10 NCAA Division III sports as well as club, intramural, and recreational sports. Students can also choose from a diverse variety of more than 30 clubs and organizations. If we don’t have a club you want, you can start your own! Cedar Crest also offers a number of academic and student support services, from year-round housing to guaranteed on-campus employment. Our faculty and staff go above and beyond to make sure every student has the best experience possible.